Thoroughbreds can be very sensitive, but also very resilient. That’s what makes them such great partners in this sport. They’re forgiving, and they’ll keep going—Even if they’re in pain or uncomfortable. My horse, Oz, has the added bonus of being bred tough. His sire, Skip Away, ran his entire Hall-of-Fame earning career with a known bone chip in his ankle. “And when you’ve got a horse who tries as hard as Skippy does, he’s really special to you. We’re not ruled by the dollar.” – Sonny Hines, Skip Away’s beloved trainer. Because Oz is so stubborn and tough, I often find it difficult to tell when he’s unable to do something or just plainly doesn’t understand how to. That is why once a month Oz get a visit from his sponsor, Carrie Copley, RMT & Equine Massage Therapist, to let me know what’s going on that I can’t see and can only sometimes feel. 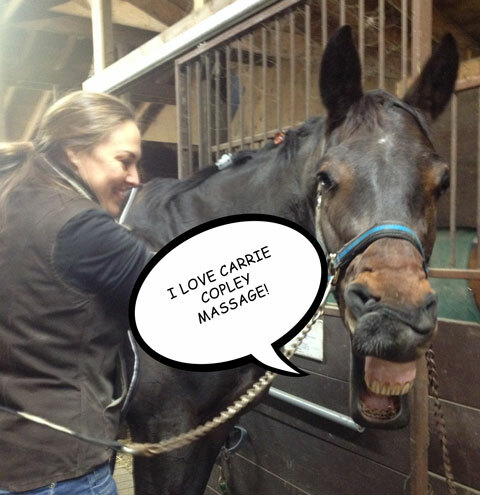 I thought it might be helpful to readers for me to share why I get massage for my horse. Let me start by saying this: I can only tell you what works for me and my horse. If you don’t get massage for your horse, you are not a terrible person. You’re far from it. The fact that you’re reading this blog means you’re open to others opinions, and interested in educating yourself. If you decide/you’ve decided that it’s not something you’re interested in that’s fine. We can still be friends. I’d love to listen to your opinion with equally open ears and mind (and a beer, I drink Guinness. Thanks). The closer we become to our horses, the better we get at communicating with them. This is a double edged sword as, after 7 years together, Oz is fairly good at reading what I’m asking him to do… but Oz has become very proficient at telling me to “F@*% OFF” as well. It’s then up to me to decide if he a) Doesn’t WANT to do it (Theory X manager , for business majors) b) Doesn’t know HOW to do it, but would do it happily if he did (Theory Y Manager ) or c) Can’t physically do it. I’m more of a Y Manager. I believe that Oz really wants to do what I ask. In fact, I know he does because he gets very stressed when he can’t figure out what I want. He’s also very enthusiastic about his job when he does it right and hears those magical words that mean a cookie is coming: “Good kid”. ”But he’s a good horse,” Hines said. ”You can make a million mistakes with him and he covers them up.” (Regarding Oz’s sire, Skip Away). When Oz can’t do what I’m asking, it’s torture for both of us. I keep questioning my skills in asking correctly, and he keeps getting stressed because he can’t perform the movement and starts losing hope that he’s ever going to get a cookie. That’s when I decide it’s time for massage. Before “Magic Hands” Carrie starts, I always let her know if we’ve been struggling with anything. Sometimes it’s getting a lead change to the right. Other times it’s just an overall attitude problem. At the end of the massage, I’ll know if there’s a certain muscle group that’s stiff or sore, or maybe not strong enough. Sometimes it’s completely a case of “It’s not you, It’s me” and I’m not asking correctly, but at least then I know that is the case. Sometimes I even find out the things I’ve been struggling with are symptoms of a much smaller problem that is easily treated! (Hence the nick-name, Magic Hands). Note: Your equine massage therapist does not ever replace your vet. If you notice your horse acting strangely, there’s a swollen limb, a hitch in his/her giddy-up, etc. call your vet first. Once your vet gives you a diagnoses and treatment plan, or writes it off as over-protective-parent syndrome, ask them about massage! Sometimes massage can speed up recovery and get you back in the saddle faster. But Rule #1: Listen to thy vet. My horse occasionally suffers from equine exertional rhabdomyolysis syndrome, an extreme form of tying up. What can I say, he likes to “Go Big, or Go Home”. Since changing him to Biostar whole food feeding program, and a dose of Equi-Winner patches, he hasn’t had any issues, but it’s always on my mind when handling him. Massage helps to notify me if the muscle groups associated with tying up are sore, and if I need to change any of his strict feeding and exercise regime. It also helps ensure the lymph system is working properly. The lymph system balances lymph fluid (mostly protein & other stuff that’s been over-produced or improperly manufactured) in the body. It’s the bodies garbage removal service, transporting cancer cells, excess protein, red and white blood cells, and other gunk out of the body. You know when something starts rotting in the garbage and your entire house starts to stink? That’s what your horse feels like when the lymph system isn’t working properly. Yucky is the Non-Medical Term. It can also affect the muscle groups surrounding the blockage causing edema and inflammation, as well as impair the immune system. Massage techniques can re-direct the “gunk” holding up the lymph system, and allow it to continue its route around the body. No gunk = less chance of build up. That means protein can get to the muscles to help them grow and repair themselves! Garbage can also be transported out of the muscles to make sure they keep performing efficiently. The horse has 700 skeletal muscles compared to 642 in the human (depending on what sources you read). Muscles make up 60% of their body mass, compared to roughly 40% in the human body. So horses are NOT humans. They rely more on muscles to make their body work effectively, and to do the amazing things they do with their body! Massage breaks down the knots and frees muscle fibres to allow the muscles to work efficiently. What does this mean for training? It means having the ability to train harder, increased flexibility and I personally see a better work ethic in my horse after massage. It also helps him recover faster after a clinic so I can start ironing out the mistakes faster and getting ready for the next one. For others it may mean the difference in holding a lengthened stride all the way from M to K, resulting in an 8 instead of a 6, and I’ve seen 1st and 2nd place finishes closer than 2 points apart. That being said, massage does not make your horse a winner. You still need to work hard, train hard, and train correctly. It also doesn’t replace a proper warm up and cool down. Those are important to support the hard work your massage therapist and horse put into operating efficiently. So there it is! Again, I’m simply telling you what works for my horse and why. If you’re not interested in massage for your horse, that’s fine and there’s nothing wrong with that. It’s as equal a decision to me as lunging before you ride. If it works for you, go for it! If it’s not for you and your horse, that’s fine too. If you’re interested in getting a massage therapist out to see your horse, and you’re in the Southwestern Ontario region, I highly recommend Carrie Copley, RMT & Equine Massage Therapist. Not just because she sponsors ‘Team Oz’, but because she has an amazing connection with horses that can’t be taught in a classroom. She works on people as well and can use her wealth of knowledge of both the human and horsey body’s to help your team work efficiently together. If you’re not in her service area, she can also recommend someone whose service area includes your horsey! Your vet may also recommend someone, which is always a great testimonial to their work.